www.anajet.com/hbm * 855.863.1638 AnaJet Digital Apparel Printers print decorative graphics directly on t-shirts, aprons, mouse pads, towels and other promotional products. This allows for a huge selling market; to companies, schools, clubs, tourists, etc. The promotional product industry in huge; and AnaJet makes success possible with their easy to learn, easy to operate system. 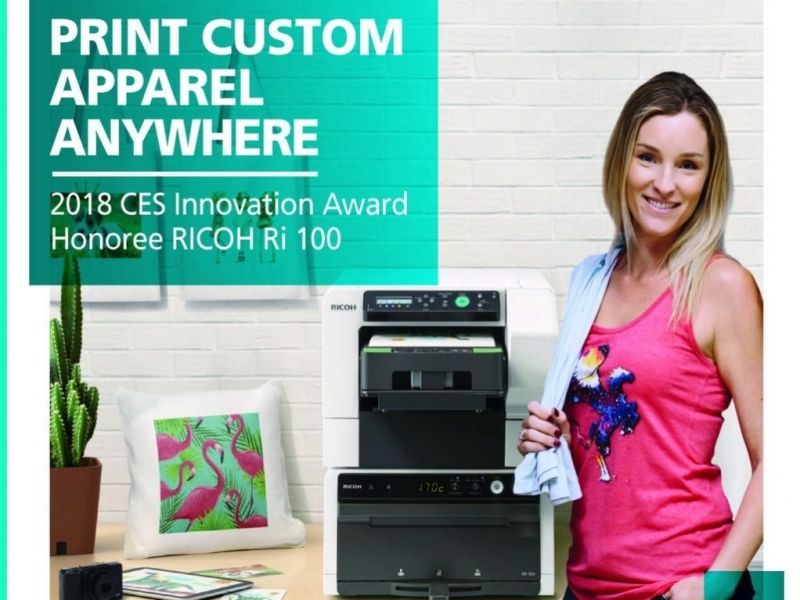 Introducing the RICOH Ri 100: The low cost, simple, comprehensive direct-to-garmet printing system and 2018 CES Innovation Award Honoree in Computer Peripherals category. * Low-Cost Initial Equipment Investment * Start Your Custom T-Shirt Printing service in a snap * Easy-to-Use Printing Process AnaJet printers can print on both white and dark shirts using environmentally friendly water-based inks. Made in USA. AnaJet provides complete, comprehensive training that will give you the comfort and confidence you need to successfully operate your printer. And our tech support team is top notch and here to serve you! We are constantly refining our printers to make sure they are the most user-friendly printers on the market.